A strictly limited run of 26 SP-1 Joey Dunlop replicas are being built to celebrate his life. The first one completed of this exclusive run is being auctioned off to raise money for Joey’s family. There will be one SP-1 for each of Joey’s historic TT wins. 25 will be sold with an asking price of £14,300, the first one made, but numbered No26, is up for auction between now and the 2002 TT festival in June. Each has a plaque on the top yoke inscribed with " Commemorating 2000 F1 TT " and bearing the edition number of the bike and Joey’s signature. The bikes are being built by top tuner Russell Savory.
" I wanted to do something to commemorate Joey, he meant so much not only to me but to the whole biking community. I thought his 2000 Formula One TT win was his best ride ever, it was unbelievable. That is why I made this bike. To celebrate Joey’s life, " said Savory. And the V-twins have the backing of Joey’s widow Linda.
" Joey would be proud to have a bike made after him. It’s the way he would have liked to be remembered, " she said. If you want to bid the bike will be on show at the Ally Pally show starting January 26 and closing February 3. Next to the bike will be a box where you can put in an envelope with your bid. You should, of course, include your name, address and daytime contact details plus the amount you are bidding. The auction will remain open until May 31, the Friday before the F1 race of the 2002 TT and we’ll be bringing you regular updates of where the bidding stands. Postal bids are also welcome. They should include the same details as above. 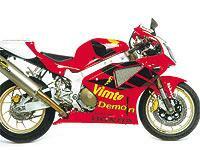 They should be addressed to MCN Joey Dunlop SP-1 Auction, Media House, Lynchwood, Peterborough Business Park, PE2 6EA. The other Joey replicas will only be sold through one shop, Tippetts Motorcycles of Surbiton, and individual bikes will not be displayed to the public. The only bike you are likely to see is number 26, the bike up for auction. The standard SP-1 wheels are replaced with Oz wheels. Made of aluminium billet they are anodised gold and weigh 2.2kg (4.4lb) less than the stock items. Also new is the rear shock. The top of the range WP is adjustable for everything and wouldn’t look out of place on a WSB grid. A carbon hugger helps keep it that way. Brake lines are steel braided and rear-sets add to the authentic road-racer look. But as well as looking the part the bike will also sound it. High-level Laser exhaust pipes and a Power Commander come with every bike, pushing the power up from 124 to 130bhp. If you need to return the bike to standard, each will be supplied with all the road going kit that has been removed. Honda UK has not officially sanctioned the bike but Tippetts is offering its own two-year warranty. Tippetts can be contacted on 020-8399-2417. See more on this in MCN, published on Wednesday July 23, 2002.